Everyone’s favourite Mid-Autumn Festival is soon approaching! Besides the beautiful lanterns and spending quality family time, the main event is sharing mooncakes under the beautiful moon. Here are the top picks you won’t want to miss. 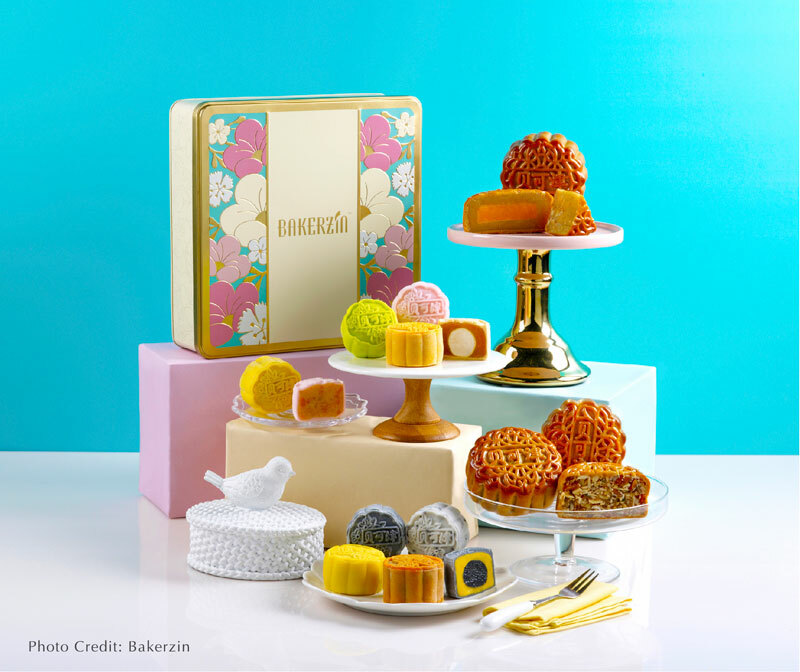 This year, Bakerzin’s mooncakes are handcrafted with premium low sugar lotus paste. Talk about twice the pleasure and half the guilt! Choose from classic baked skin flavours or new unconventional additions like the Tom Yum Mooncake or American Ginseng Mooncake, priced at $60 – $66 for a box of 4. 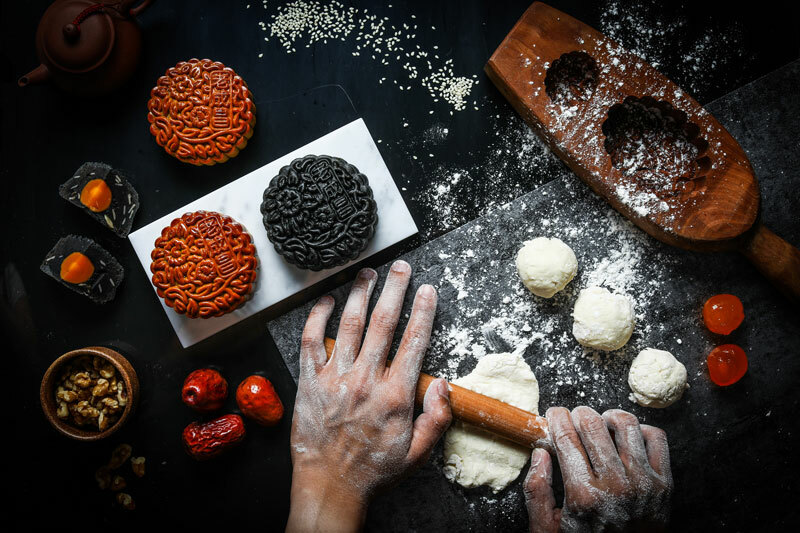 If you are a snow skin mooncake lover, fall in love again with their buttery, premium-grade Durian-flavoured mooncakes or the rich and flavourful roasted Black Sesame mooncake variations. Click here for the full list of flavours and order online or get it from any Bakerzin and Nom La La by Bakerzin outlets in Singapore. Collection of mooncakes starts from 10th September 2017 and the last day of sale and collection at outlets is on 4th October 2017. Online ordering ends on 2nd October 2017 at 2pm, the last day of delivery is 3rd October 2017. 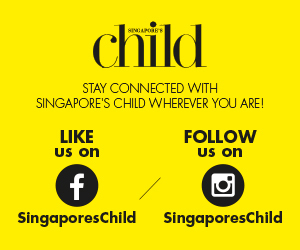 Enjoy 15% off till 31 August and 10% off till 10 September, and an additional 15% discount for DBS/POSB Cardholders and 10% discount for Passion/SAFRA members. The long-standing maestro of delectable and innovative mooncakes, Goodwood Park Hotel celebrates this magical Mid-Autumn Festival 2017 with its finest masterpieces and unique new creations. 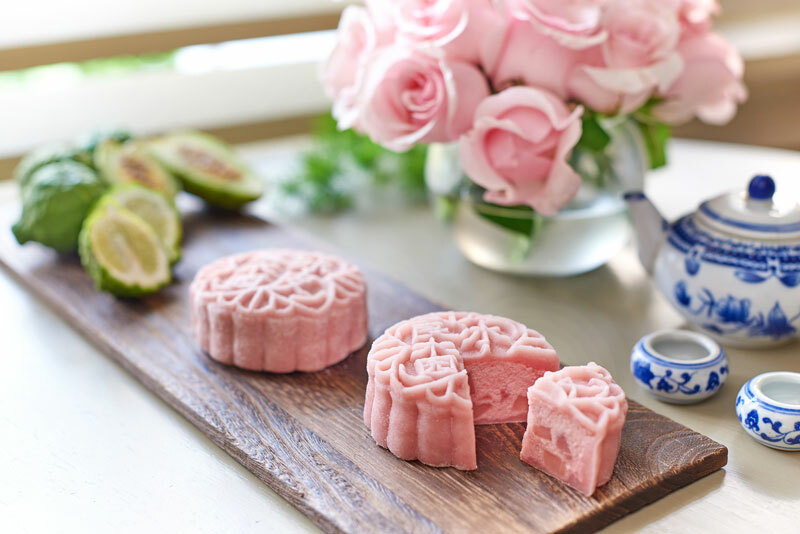 Joining the hotel’s line-up of popular fruit-based snowskin mooncakes this year is the intriguing Prickly Pear with Bergamot Snowskin Mooncake. Fans of Goodwood Park Hotel’s famed king-of-fruits mooncake can look forward to the signature D24 and ‘Mao Shan Wang’ Durian Snowskin Mooncakes that are back by popular demand. Click here to check out the brochure, and click here to see the full list of special promotions and how to order online. From 23 August (3pm onwards) till 1 September 2017, buy a minimum of 2 boxes to enjoy 25% off. (only by walk-in at The Deli). From 19 August to 28 September 2017, enjoy 15% off all items for online orders only. 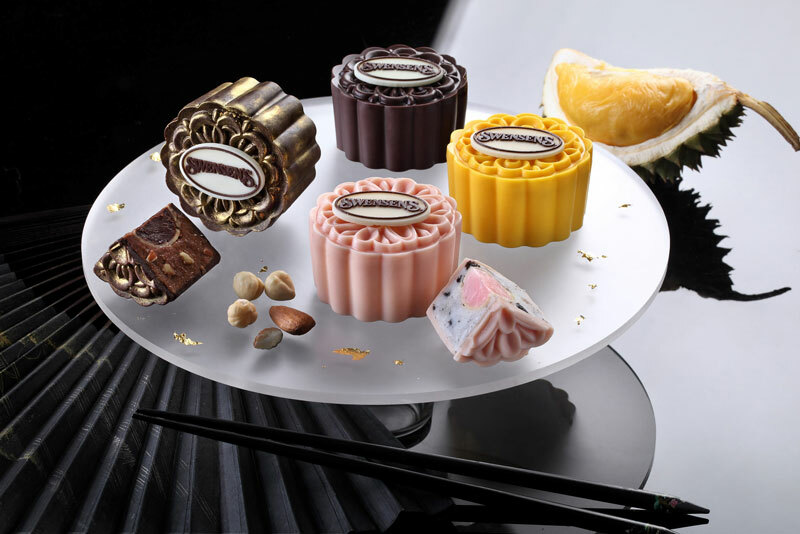 Peach Blossoms celebrates the Mid-Autumn festival with an ensemble of mooncakes that come in three sizes – mini, standard and a considerable 6.5 inch piece. A Peach Blossoms’ signature, the Charcoal Black Sesame Paste with Melon Seeds and Gold Dust Mooncake comprises of fragrant black sesame paste complemented with melon seeds, topped off with a sprinkle of gold dust which adds a touch of sophistication. 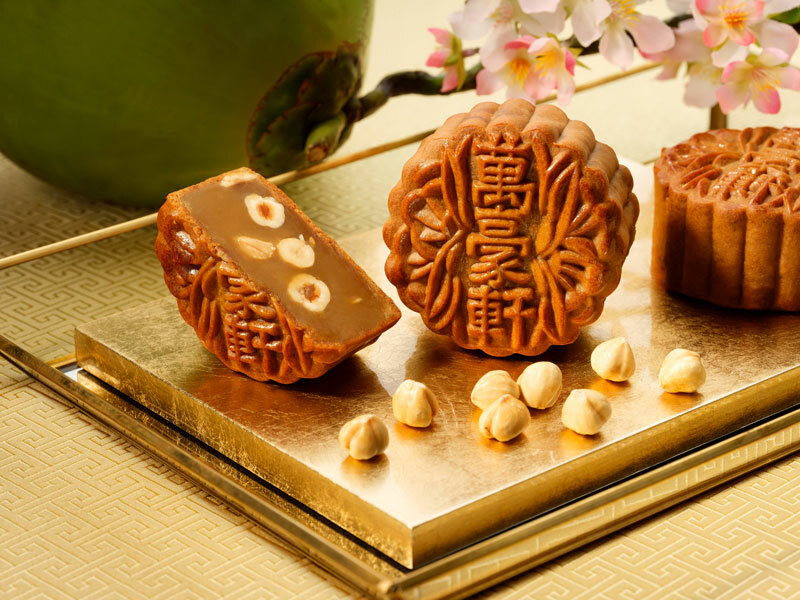 The Wu Ren (Mixed Nuts) Mooncake offers a refreshing, vegetarian option comprising of 5 types of nuts and orange peel. Those looking for a less sweet option can go for the Single Yolk with White Lotus Paste Mooncake, a perennial favourite. Selected credit cards enjoy an early bird discount of 25% off between 28 August and 10 September 2017, and a regular discount of 15% off between 11 September and 4 October 2017. Founder and baker extraordinaire, Daniel Tay, is proud to present a luscious range of 8 Old Seng Choong baked mooncakes, including new flavours such as Black Sesame with Yolk & Melon Seed, White Lotus Paste with Longan, Red Dates & Walnuts and Wu Ren Bakwa with Kaffir Lime Leaves. This year’s line-up of sweet treats also comprises a repertoire of FOUR mini snow skins with chocolate truffle ganache centres infused with all-time favourite liquors such as martini, whiskey, rum and Choya. To top Old Seng Choong’s offering this year, a limited edition range of animal-design baked mooncakes makes an appearance to bring smiles to the little ones and the young-at-heart! Click here for information on all the flavours. On-line sales start on 22 August till 3 October 2017 here and booth sales start on 31 August till 4 October 2017. DBS/POSB Card Members enjoy an additional 5% off their purchases on top of the early bird discount offered. Xin Cuisine Chinese Restaurant unveils two new low sugar snow skin flavours for those looking for a healthier but equally delicious treat. The new Low Sugar Red Lotus Seed Paste with Peanut Praline Snow Skin Mooncake places great emphasis on understated simplicity coupled with unparalleled flavour. Another new creation is the Low Sugar White Lotus Seed Paste with Banana Apricot Praline, this fruity treat combines the sweetness of banana with the faint tartness of apricots and is bound to delight one’s senses. These delightful mooncakes are available from the Hotel Lobby for purchase and collection from 4 September 2017, as well as eight other locations islandwide. Place your order online from now till 31 August 2017 and enjoy up to 30% off today! Call 6731 7173 for more information. Celebrate the Mid-Autumn Festival and create endless moments of joy with a stellar ensemble of 12 artisan mooncake creations that marries culinary imagination and the interplay of the finest ingredients with traditional craftsmanship by Wan Hao Chinese Restaurant’s team of culinary masters. 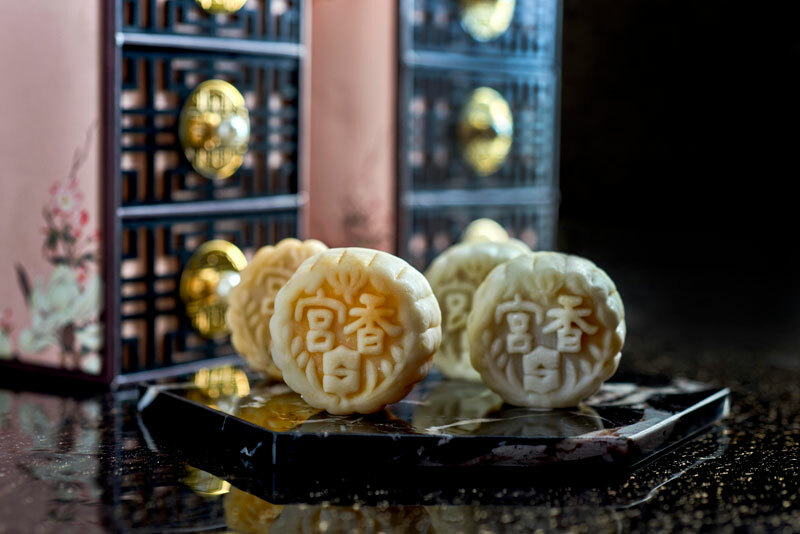 Those who have a penchant for classic treats will love the White Lotus Seed Paste with Single/Double Yolk Baked Mooncakes for a true taste of tradition. Baked to a gorgeous golden brown, the white lotus seed paste within is silky and gently sweet, while the yolks hold just the right amount of saltiness and are perfectly cooked. Another best seller is the Pure ‘Mao Shan Wang’ Premium Grade Durian Snow Skin Mooncakes. 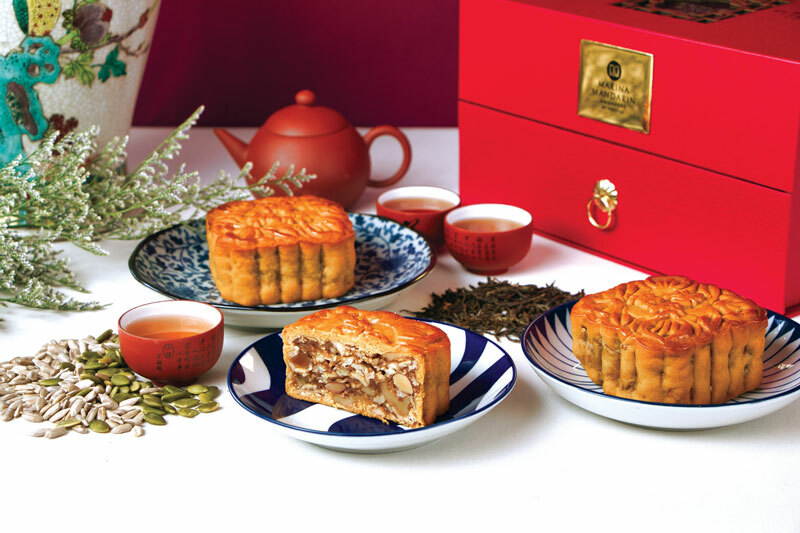 A close- your-eyes-to-enjoy-it dessert, this mooncake will excite your palate with its sweet, creamy and mildly bitter filling, encased in silken snow skin that melts in your mouth. Baked skin mooncakes are priced from $63 to $78 for a box of 4 and snow skin mooncakes are priced from $63 to $73 for a box of 8. Purchase them at Wan Hao Chinese Restaurant, Singapore Marriott Tang Plaza Hotel, 320 Orchard Road, Singapore 238865. You can also order the baked skin selections online. To celebrate the mid-autumn festival, Shang Palace at Shangri-La Hotel, Singapore presents a selection of limited-edition mooncakes with traditional and contemporary fillings, including The Shang Palace Mini Snow Skin Eight Treasures Gift Set’s two new flavours: Yuzu Bird’s Nest and Chocolate Salted Toffee, with four pieces of each flavour ($88). The luxurious Yuzu Bird’s Nest mooncake has a tangy sweet and sour yuzu filling with premium bird’s nest in its core, wrapped in delicate snow skin. The Shang Palace Four Treasures Gift Set (S$78) is an ideal gift comprising four traditional hand-baked mooncakes: Low Sugar White Lotus Seed Paste with Double Yolks, Low Sugar White Lotus Seed Paste with Single Yolk, Low Sugar Plain White Lotus Seed Paste and Mixed Nuts with Chicken Sausage Ham, with one piece of each flavour. Mooncakes may be ordered at Shangri-La Hotel lobby, Shang Palace, at the pop-up shops at Takashimaya, Vivocity, Parkway Parade, Jurong Point and Raffles Xchange from 1 July to 4 October 2017 or online here from 1 July to 2 October 2017. Order online now and enjoy a 25% early-bird discount, enter promo code SLSEARLY25 to enjoy the savings. Swensen’s proudly presents its all-new Sweet Medallions mooncake range this Mid-Autumn Festival, consisting of four decadent chocolate covered ice cream gems: Rocher Crunch, Sticky Chewy Chocolate, Durian Royale, and Cookies N Cream Surprise! Add a twist to this sweet Mid-Autumn tradition, these tantalising mooncakes promise shared moments of happiness with family, friends and colleagues. The mooncakes are available at $48.80 for a box of 4 pieces (mix and match flavours) $12.20 for a single piece from 15 August to 4 October 2017, at all Swensen’s and Earle Swensen’s outlets islandwide. From now till 20 September 2017, enjoy an early bird discount of 20% and from 21 September till 4 October 2017, enjoy 15% off. Check out their website for more details on card promotions. Hello Kitty Orchid Garden, the 24-hour themed café built around the world’s most iconic feline, celebrates Mid-Autumn Festival this year with the return of its popular traditional baked mooncake, embossed with the charming feline ($33.80 for a box of 2 pieces), available from 17 August to 4 October 2017. 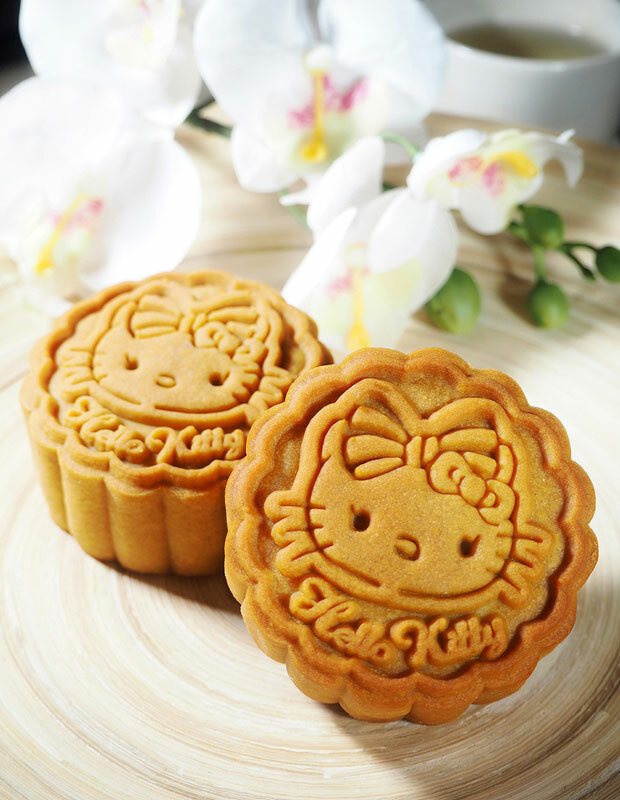 The lovable kitty inspired mooncakes are presented in an elegant white and gold Oriental floral designed tin box with a brand new packaging sleeve, sporting Hello kitty and her little friend, Tiny Green; will be a definite hit with family and friends of all ages. Each mouth-watering gem is filled with creamy white lotus paste, melon seeds and a single yolk. From now till 14 September 2017, order here and enjoy an Early Bird price of $29.80 per set. GODIVA proudly introduces its 2017 Limited Edition Chocolate Pastry Mooncakes – these divine mooncakes will light up any face, warm every heart and draw a dazzling smile to anyone who takes a bite. With show-stopping flavours such as their Sea Salt and Hazelnut Milk Chocolate Pastry Mooncake, a remarkable pairing of two heavenly ingredients; sea salt hazelnut milk chocolate sponge cake topped with hazelnut milk chocolate, drawing beautiful aromas of cocoa and hints of sea salt, prepare to sit down together to bask under the moonlight while indulging in these rich flavours. Other flavours include Raspberry Dark Chocolate, Crunchy Nuts Milk Chocolate and Almond Dark Chocolate. 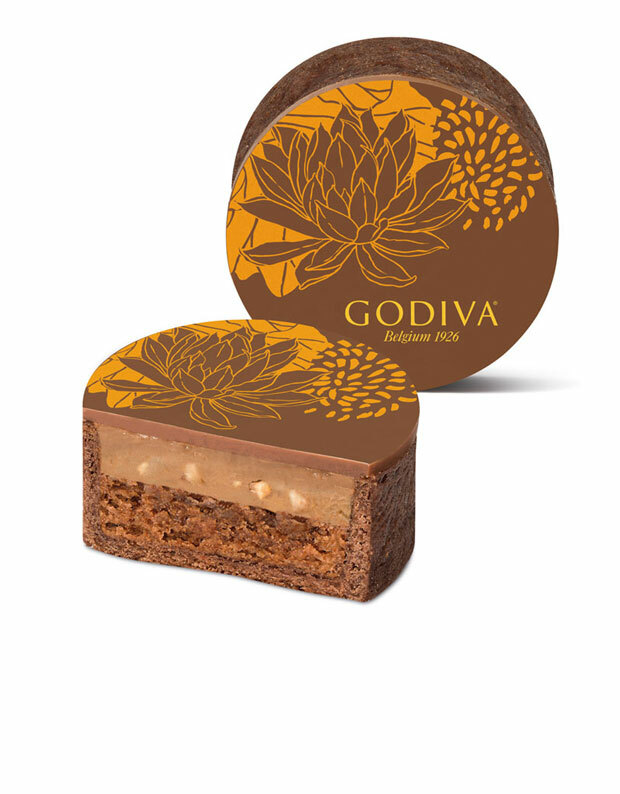 Pre-orders are available at all GODIVA stores and café in Singapore. Shop them online here. 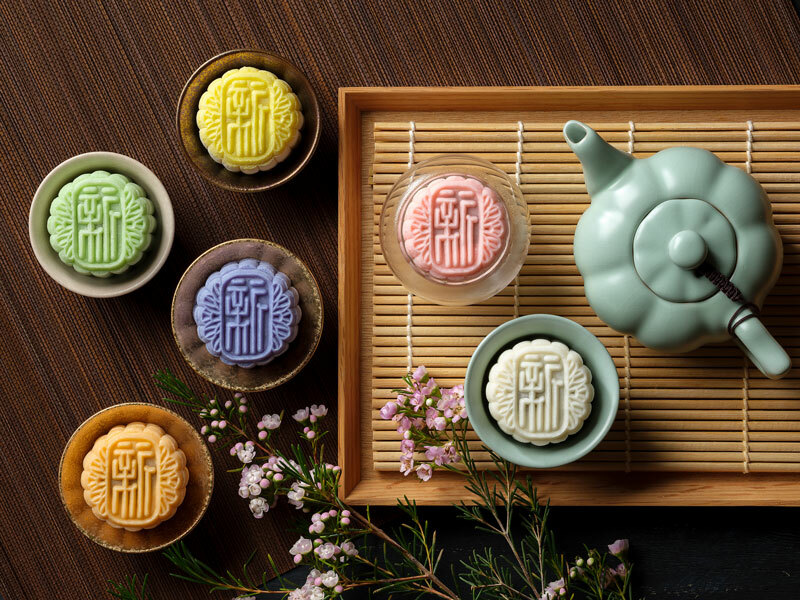 Häagen-Dazs has taken inspiration from the myth of the Jade Rabbit to design a whimsical and contemporary range of ice cream mooncakes featuring new designs and exciting flavours. 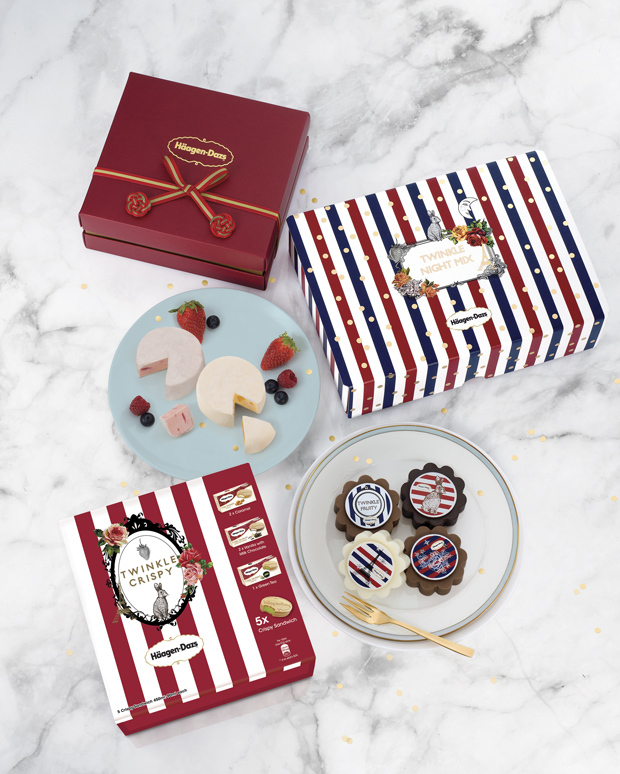 Choose from Twinkle Crispy ($29.90 for a box of 5), made of Häagen-Dazs ice cream wrapped with smooth chocolate and sandwiched between crispy wafers, Twinkle Night Mix ($75.00 for a box of 6), consisting of chocolate-coated ice cream mooncakes, Harmony Mochi ($75.00 for a box of 4), a new creation featuring Häagen-Dazs™ ice cream wrapped with premium soft and chewy Japanese mochi skin or Lune et Etoiles ($98.00 for a box, Limited Edition), consisting of 1 very special ‘moon’ surrounded by 7 ‘stars’ – each mooncake is coated with dark chocolate and decorated with elegant Parisian-themed chocolate designs. Lune et Etoiles is a super premium collection and is limited to just 100 sets in Singapore, exclusive to Tang’s. Twinkle Crispy, Twinkle Night Mix and Harmony Mochi are now available in stores. Hurry before they run out! With more than 70 years of history, Thye Moh Chan’s carefully curated selection this year includes a new flavour, the Chef’s Private XO Recipe, and they have brought back long-time favourites such as the Mao Shan Wang Durian and Yam flavours. By melding traditional and innovative elements in both flavour and design, Thye Moh Chan continually delights customers with classic favourites and new offerings. 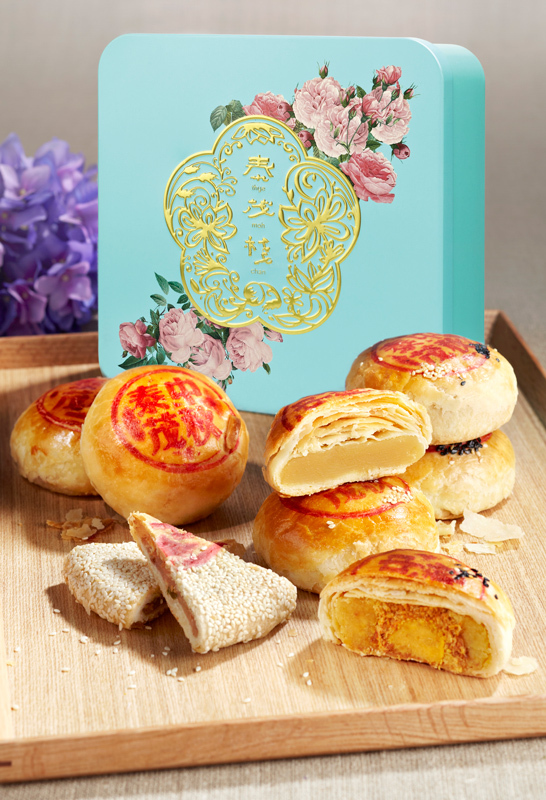 Sold in either boxes of four or larger individual pieces for selected flavours, the mooncakes are beautifully encased in contemporary packaging with tasteful floral motifs. Its elegant pastel packaging and authentic Teochew offerings makes it an ideal gift for both young and old. Ranging from $29.80 to $40.80 per box, check out their website for the full list of flavours. Now selling at the brand’s two outlets located in Chinatown Point and Paragon till 4 October 2017, enjoy their Teochew Mooncake at $10.00 (U.P. $18.80) with a minimum purchase of 2 boxes of Classic mooncakes (4pcs/box). Have a happy Mid-Autumn Festival with the family while soaking in the moonlight and munching on these treats!